The LoRaWAN software stack is based on plain Aloha. Plain Aloha is a model that describes the typical package loss due to collisions of uplink transmissions in an unsynchronised communication system. With a LoRaWAN system, the model shows 82% package loss at maximum throughput. On top of this we get additional package loss during LoRaWAN gateway Tx. LoRaWAN gateways cannot receive any uplink transmission packages during a downlink transmission. A 10% duty cycle for the gateway means that for 10% of the time it is ‘blind’ and will loose all packages during downlink transmission – one in ten data packets will be lost. The above mentioned 82% package loss is based on the collision with packages in the LoRaWAN gateway’s cell itself – it does not take into consideration losses caused by other LoRaWAN gateways in the same region. Nodes on LoRaWAN connected to gateways servicing adjacent cells will interfere with their own nodes as well. Furthermore, non LoRa modules will generate collisions on the air interface as well. And the hits just keep on coming – a LoRaWAN gateway is based on expensive gateway chips connected to an embedded PC. A clever team in Lower Saxony have a way out of the LoRaWAN jungle. Seven LoRaWAN spreading factors and three frequency channels with high package loss makes no sense. At lower throughput, the package loss will be lower but, with a smarter protocol, the package loss can be avoided and additional expensive LoRaWAN gateways can be avoided. 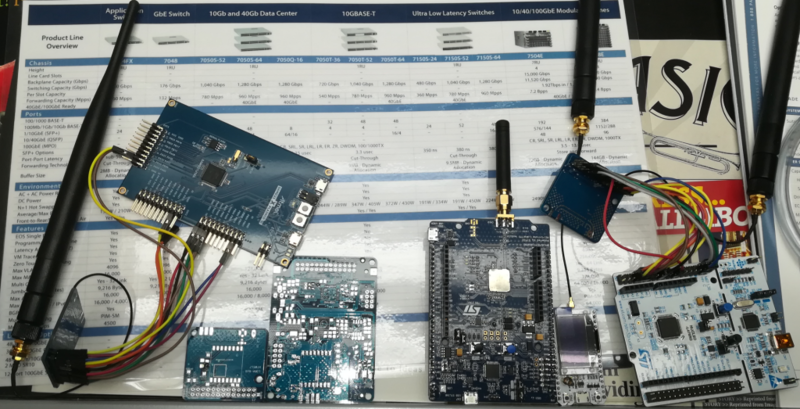 The German engineers developed an ingenious protocol stack supported by a standard LoRa IC SX1276 and a common STM32 MCU. The result is an inexpensive gateway with much lower package loss and much longer battery standby time for the nodes. The new protocol is called radio shuttle: http://www.radioshuttle.de/en/radioshuttle-2/. The stack supports listen before talk, communication to the gateway and some additional interesting features. A small to medium size network in terms of the number of nodes can be covered with radio shuttle – low cost and simple. If LoRaWAN is the VW of the LPWAN world then Weightless is the Mercedes. It is the high performance technology of choice for industrial IoT and where medium to high throughput and capacity is critical. Weightless ticks every box for a modern LPWAN protocol stack. It offers TDMA, FDD, Frequency Hopping, Listen Before Talk, Channel black list and a lot of more as well. Weightless is not like LoRaWAN, limited to 1% duty cycle in upload and 10% duty cycle in download. It is not “blind” during Weightless base station Tx because the uses Time Division Duplex. In the synchronised Weightless network end devices are under the control of the gateway and are instructed not to transmit during a downlink Tx. The synchronised communication protocol takes care of the transmit and receive slots for end devices leading to a near 100% spectral efficiency. Has this article piqued your interest? Do you plan to deploy your own private LPWAN? Do you plan to deploy IoT devices with embedded antennas? Do you have an IoT prototype and need to optimise the design or minimise the price? If you have answered YES to any one of these questions then please do not hesitate to drop an email to harald.naumann (at) lte-modem.com and to ask for a proposal or some engineering services to make your IoT idea a cost-effective reality.